The Bird Box Challenge is another clear reminder that brands need to be prepared for unseen threats. Just as the stars of Netflix’s "Bird Box" have to protect themselves from unseen threats, brands must be ready to defend themselves from completely unexpected, and at times unimaginable, scenarios. The latest hazard brands need to add to the crisis playbook? Being given a starring role in dangerous viral challenge videos. One year ago, New England Patriots tight end Rob Gronkowski starred in a Tide video dissuading teens from participating in the viral Tide Pod Challenge. The broadly distributed video, which received more than 10 million views on Twitter alone, ultimately helped to slow down the ill-advised social media trend that involved people filming themselves eating Tide laundry detergent pods. "Our ultimate goal was to protect the safety of the people," says Petra Renck, spokesperson for Tide parent company Procter & Gamble, via email. "P&G’s actions helped to stop the harmful meme-postings and protect the teens." When the meme trend faded, so did the incidents. The number of calls related to the intentional misuse of Tide Pods to poison control centers decreased significantly from January to February 2018, Renck adds. Netflix has found itself in similar choppy waters with the Bird Box Challenge over the past month. 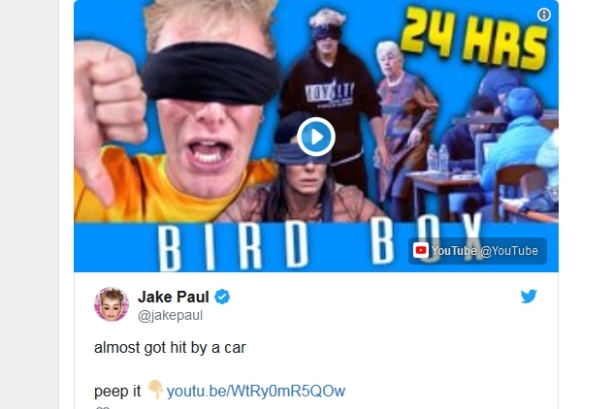 Its popular horror movie "Bird Box" has inspired people to share videos of themselves blindfolded, like the stars of the movie, attempting to complete tasks such as walk down stairs or drive. Last week, Netflix tweeted a jokey message warning people against the challenge. Netflix and Tide both "stayed in their lanes" with how they responded, but took different tactics, says Rich Cutter, SVP and group creative director at EP+Co. "They have very different voices," he says. "Netflix is savvier and Tide is more straightforward. If Netflix had posted something that sounded corporate or official sounding and didn’t stick to their voice, people would have ignored it or gone negative with commentary because their voice changed." Although a brand might create more awareness of a viral challenge by addressing it, experts say that staying silent on the matter is worse. As with other crises, if a company doesn’t tell its story first, someone else will. "People will do dumb things," says Barbara Laidlaw, MD of global reputation risk and advisory at Allison+Partners. "Had [Netflix] stayed silent, they could have been called out for looking complicit or enjoying the publicity or having something to do with it." If just one person ends up in the hospital, and a brand hasn’t released a statement beforehand, "that’s not good for business," says Indicate Media founder and president Todd Barrish. On Friday morning, the Layton Police Department of Layton, Utah, said in a social media post that the Bird Box Challenge was to blame for a local car wreck. When trying to stop an ill-advised brand challenge, experts agree that brands should target a broad audience, rather than solely focusing on those most likely to do the challenge, such as millennials and Gen Zers. James Fuller, MD and leader of Hill+Knowlton Strategies’ U.S. public affairs practice, notes that the people creating these videos are a "unique population set" that is hard for corporate America to reach. "Media helps to get this message out to people who do touch that audience like educators and parents – people who can pull an adolescent aside and say, ‘Think about what you are doing and understand there could be the potential for danger and you don’t need to always follow,’" says Fuller. "The message should come from someone who has a connection to the person who might make that video." While it may seem futile to change the minds of those even considering a social media dare, if a brand’s message makes just one person stop and think, perhaps that is a good thing, says Laidlaw. Tide was "smart" to use Gronkowski to get through to young people, adds Barrish. "He hit the target audience of people that were doing this ridiculous thing, instead of the CEO saying, ‘Kids, don’t do that,’" he explains. "They found someone who could speak to the demographic." The athlete helped P&G to capture the "imagination and attention" of the target audience, adds Fuller. Netflix could have taken a similar influencer route by creating a 15-second disclaimer video with "Bird Box’s" lead actress, Sandra Bullock, suggests Gerard Braud, CEO and president of Braud Communications. "Netflix has the ability to put a trailer before each show before it comes on," he says. "They weren’t using the tools that were available to them. They weren’t using the power of their own network. They own their own comms channel." Fuller adds that Netflix’s tweet was an appropriate, measured first-level response. Now the brand should closely follow the issue to determine whether to further escalate comms. "These viral things are finicky items, and you have to pay attention to the velocity and the level of uptake," says Fuller. "Sometimes those things will explode and sometimes they will fizzle out." "Stupidity is nothing new," says Braud. "What is new is the obsession of people to get likes on social media and to become insta-famous doing something stupid. Brands have not had to account for that in the past. Now they must." To nip this issue in the bud from the get-go, brands should build an authentic crisis comms plan for each product, anticipating what foolish people could do with it on social media. "They must sit with a dunce cap on and look at the vulnerabilities of what might go wrong before it ever does go wrong," says Braud. "You may discover that the product needs to be changed in order to keep the stupid stuff from happening. Immediately, Tide Pods looked like candy to children. A vulnerability assessment should have caught that." Should Netflix have turned a blind eye to the Bird Box Challenge?